Stryker (Tony) is a Barbaro son. He brings his own group to the cross with Gridiron, Barbaro, RaggedHill Nip, Smkescreen,Brannigan, Commander Casey Jones and Smoke Rise Buck. 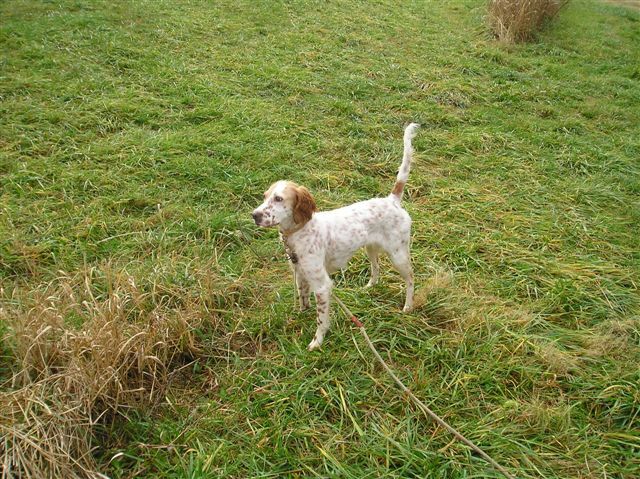 He is a ground tearing straight tailed wonderful bird dog. She is a daughter of a cross we made with Champaign Bosox (a slugger grandson) to Blue Bell Rockette (a slugger daughter). This cross is actually based on the types of dogs as she is a very classy going straight tailed hunting dog of mine. Dom Preite bred his Slugger Daughter Bluebell Rockette to my Bosox. Rockette is a littermate to Blue Bell SueZ and Grouse Ridge Jugs. Bosox is a son of Cadillac Jack and Slugger son. Bosoxs’ mother is was one of the nicest moving setters I have seen (Shameless) and a Grouse Ridge Henry daughter. Behind all of this are several crosses to both Flaming Star and Grouse Ridge Billy Boy. Also back there are The Performer, Bozeann’s Mosely, Baraka, Dr. Ray, Mr. Motion, Amos Mosely, and those are just on her side. This entry was posted in Hot News, New Litter. Bookmark the permalink.